At least they're getting a half decent Valjean in to finish it off. 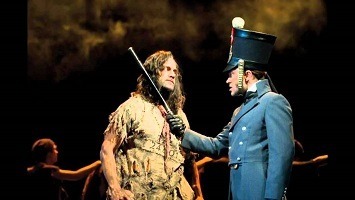 Also I only just heard Hayden Tee is coming to Broadway as Javert? Wish it was London, but still, that's cool! Heh . . . One friend of mine posted the news on Facebook, and then remarked, "Are all future Broadway revivals going to have JOJ as the final Valjean, then?" It sure makes the closing an easier pill to swallow at least! Just saw it! I thought it was honestly fantastic. John Owen-Jones was an excellent Valjean, doing an especially good job with the Soliloquy. And Hayden Tee is now one of my favorite Javerts - the Suicide was probably the best I've ever seen it done, along with Confrontation. Other standouts were the Thenardiers, Éponine, and Marius. The rest of the cast was phenomenal, though Alison Luff as Fantine definitely was not as good as the others. Her voice was fine, but her acting fell flat. It was staged beautifully, and I really liked the direction of the barricade scenes, particularly the Gavroche and Grantaire interactions. All in all, it was awesome! I hadn't gotten the chance to see this staging of it, even though it's old at this point, so it was very new and interesting for me. Actually, no. I really enjoyed Chris McCarrell's performance. His voice was a little strange at first, but I really felt the boyish energy that Marius needs from him, and he did a great Empty Chairs. His acting was better than his singing, which is fine in my opinion.